We are thrilled to announce that our project for Domus W_1 took home the gong for ‘Best Retail Interiors’ at the acclaimed Design Week Awards 2014 last Thursday. The awards ceremony, presented by comedian Adam Buxton, saw leading names in branding and design descend on the East London institution ‘Troxy’ to celebrate the very best of the industry. We attended the star-studded bash with our client, tile retailer Domus, and architect Mailen Design with whom we were delighted to collaborate on this project. Domus asked us to create a new store and showroom in London’s West End. The store is based on the concept that ‘opposites attract’: the open, inviting space features a giant suspended Domus typographic installation and a showroom with a bar zone where customers can discuss requirements over a cup of coffee or a glass of wine and browse the fantastic product selection. 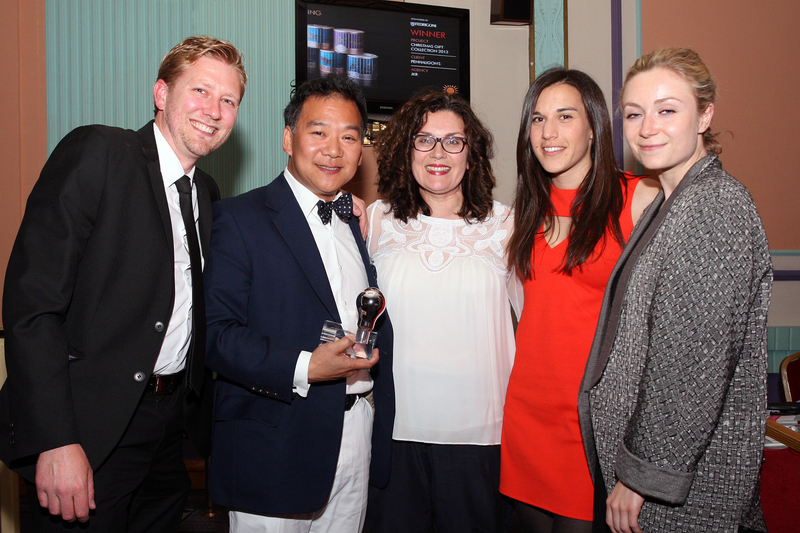 Tanya Fairhurst, Head of Interiors at I-AM and David Kong, Marketing Director of Domus, were on hand to collect the prize. This is the second accolade awarded to the Domus Eastcastle showroom, which also won second place at the Drum Design Awards last month. Overall, this is a great way to mark the tenth anniversary of our relationship with Domus. Domus W1 Launch Film from Domus Tiles on Vimeo.